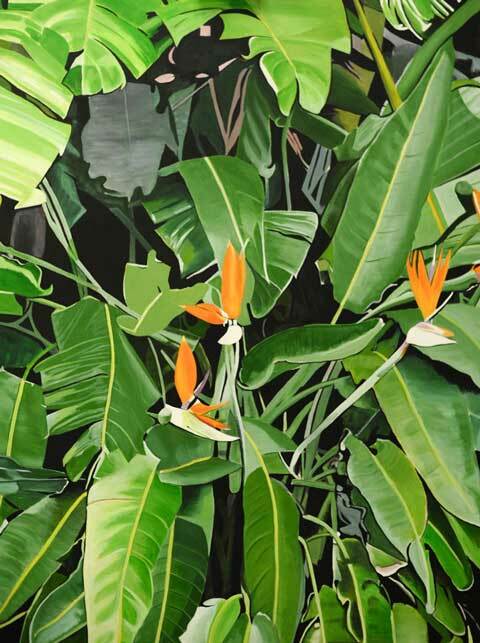 The title and subject of this painting is drawn from the Birds of Paradise plant, or Strelitzia reginae. This particularly fine specimen is found at The Auckland Zoo, New Zealand. Native to South Africa, the plant is known for its striking foliage, filling the entirety of the canvas, punctuated by beautiful orange flowers that resemble paradise birds. Acrylic on canvas, and painted for the artist’s first solo exhibition in 2012, at NorthArt, Auckland, New Zealand.